Chorlton Central Church is a congregation combining members of the Baptist denomination and the United Reformed Church togther with members of many other denominations - or none. We share a common faith while recognising and accepting a wide diversity of belief and opinion. 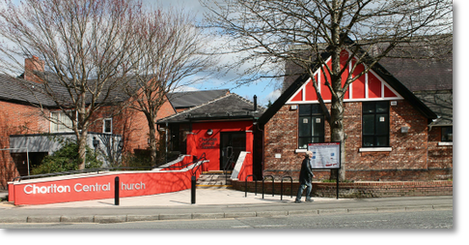 The Church is in the heart of Chorlton, a lively, leafy, cosmopolitan suburb that has many elderly people, a stable nucleus of families and a transient population of students and young working people. Church members have diverse backgrounds and independent minds, but seek to be led by the Holy Spirit. A typical Sunday congregation will have about 25 present, with an age range from 0 to 70+, but with the majority being of working age and a significant portion of these in the 20 - 30 age range. Kingdom people seek first the Kingdom of God and its justice. Church people think about how to get people into the church. Kingdom people think about how to get the church into the world. Church people worry that the world might change the church. We are committed to becoming an open and affirming congregation, welcoming people to share our journey, whatever their age, race, culture, gender, sexuality, economic status, or physical or mental ability.